I’m back with another post which I think must be related to our daily lives.If you like it do share it and keep supporting!! I think our parents are the pillars of our future .We all have watched the movie BaghBan and were triggered by its message which director,writer,actors and the entire team tried to convey. Our existence is purely because of the sacrifices made by our mother who not only let go her youth and beauty but also undergoes a severe pain,the pain of bringing a new life on this planet. When the child cries ,mother smiles .Her pain and suffering vanished away by gazing the child .In transition from a child to an adult ,parents stand like a pillar in our lives.They guide us and show us the right way even in the darkest books and corners of life. They begin to live a different life only for us , abandon their sleep which earlier was way more important to them. Then the wheel of time turns its way and our lifestyles too turns themselves.Our thoughts change through different stages of our lives.Ironically,we become quite mature to take our decisions(or we think so).Then certainly,our attitude towards our old-fashioned parents change and their advice seem to be irritating and obsolete. We name our change of attitude as a ‘Generation Gap’ ,but is it really true? Somewhere embracing the Western Culture hovering in our lives is quite responsible for it.We daily begin to make a false statement for our parents for even the slightest things.We become furious on their suggestions which seems to be interference in our lives and later our parents become a burden for us and we wish to get rid of from our lives. This is exactly what they deserve in return of bestowing love,pain ,shedding blood and tears while giving birth to new one.Don’t You Agree? Why we forget that we will ones be standing on their side sooner or later. 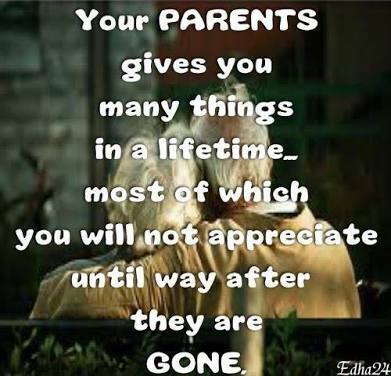 Love your parents and spend some time with them to bring smile on their face.Be their smile not a reason for their sorrow. So, leave your mobile and take time to talk with your parents and turn this so-called ‘Generation Gap’ in a ‘Generation Bridge’. Fabulous! A great post! It feels so very sad when I hear about a child leaving behind his parents. And it’s so true that one of the reasons is that we have started adopting the western culture. It really matches my thoughts. I wish I never commit such a huge sin. Your blog has got some top class stuff on offer! Keep going! Nice write up, really an awesome post !! Hi Shayra, thank you for following my blog. And very nice to be here too, I think I have read a great post of you, sweet regards for you. This post needs to be read by all especially the young adults. This is beautiful. Thank you for sharing! Funny, I just did a blog post about missing my mom. Neat thing is that I was in a spiritual program around the time that she died, and I was doing all of these amazing things to acknowledge her as part of the class! I have got an idea from observing people action .It’s dam true we are attracted towards Western Culture which is good to some extent . Take good from anywhere, that’s what I believe, doesn’t matter it’s​ Western or whatever! Everything needs good changes with time! Well! Distorting dogmas for personal motives is unacceptable which have been seen in our culture and must be rooted out.